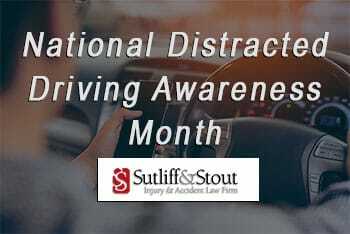 April is National Distracted Driving Awareness Month led by the U.S. Department of Transportation’s National Highway Traffic Safety Administration (NHTSA) from April 2 to April 30 for the national U Drive. U Text. U Pay. enforcement effort. The goal of the campaign is to increase enforcement to catch distracted drivers and enforce distracted-driving laws. In January 2016, texting while driving became illegal in San Angelo. Last year, the city reported 192 crashes from cell phone usage and distracted driving. According to the Texas Department of Transportation (TX DoT), approximately 10 percent of these collisions left people injured. The National Safety Council reports that drivers talking on phones, hand-held or hands-free, miss seeing up to 50 percent of their surroundings such as other drivers, pedestrians, or bicyclists. Research from the AAA Foundation for Traffic Safety shows that potentially unsafe mental distractions can persist for as long as 27 seconds after drivers use voice-based technology to dial or text. Driving at 25 mph, drivers travel the length of nearly three football fields during this time. With cell phones becoming more sophisticated as an all-in-one device it seems like it is nearly impossible not to have your phone in your hand. Distracted driving comes in many forms from fiddling with your cell phone, eating, or changing music in your car. In addition, car manufacturers are creating convenient features like touchscreen dashboards, voice commands, and other in-vehicle technologies that pose as a threat to consumer safety. Any task that requires you to take your eyes or attention off the road and the hands of the wheel can be presented as distracted driving. Program your navigation system before driving. Place your phone out of reach to prevent the desire to grab your phone. Do not engage in social media, messaging, or emails while driving. If you have to call or text while on the road, pull over. If you are a passenger, discourage the driver from using their phone while driving. The Texas Department of Public Safety offers Impact Texas Drivers, a free driving course to educate all drivers on the dangers of distracted driving in an effort to reduce car accidents. The program shares real-life stories of people who were impacted as a result of distracted driving.